Corns and calluses are a thickening of the outer layer of skin. This thickening is known medically as hyperkeratosis. Corns and calluses develop as part of the skin's normal defense against prolonged rubbing, pressure and other forms of local irritation. 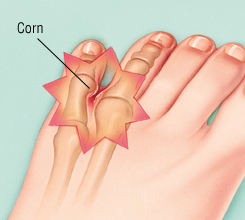 Corns — A corn is a protective thickening of the skin on a bony, knobby portion of a toe. At the center of a corn is often a very dense knot of skin called a core, which is located over the area of greatest friction or pressure. Firm, dry corns that form on the upper surfaces of the toes are called hard corns. Pliable, moist corns that form between the toes are called soft corns. In most cases, corns develop when the foot has been squeezed into a shoe that has a very narrow toe area. Less often, corns develop on deformed toes that cannot fit comfortably into regular shoes. 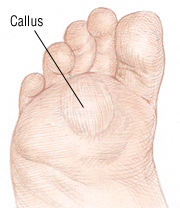 Calluses — A callus is a thickening of skin that is exposed to prolonged rubbing. Unlike a corn, the thickening in a callus is evenly distributed. There is no dense central core. Although calluses usually occur on the soles of the feet, they also can form on other parts of the body that are exposed to long-term friction. For example, calluses often are found on the hands of manual laborers, guitar players, gymnasts, weight lifters, tennis players and other people who routinely handle tools, instruments or sports equipment. Calluses can be a physical advantage — for example, among laborers and athletes — because they cushion the hands and allow the person to function without pain. On the soles of the feet, calluses typically develop near the base of the toes, where they are caused by friction from the inside of shoes. Less often, calluses are related to walking problems or foot abnormalities that place unusual stress on parts of the foot during walking. According to the American Podiatric Medical Association, painful corns and calluses affect about 5% of people in the United States every year, and many people never seek professional help.